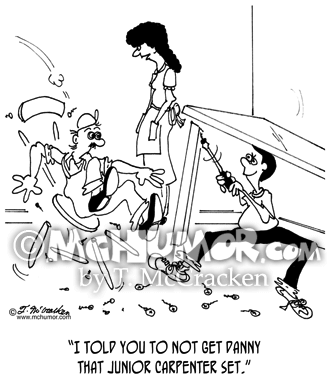 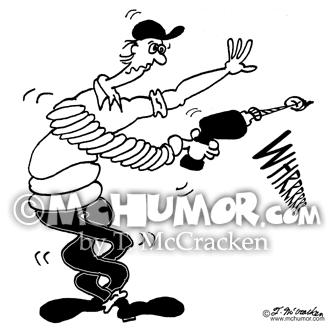 Hardware Cartoon 6557: A man's whole body is twisted after using a power drill. 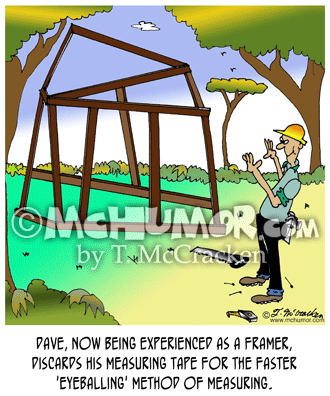 Carpenter Cartoon 6156: "Dave, now being experienced as a framer, discards his measuring tape for the faster 'eyeballing' method of measuring." 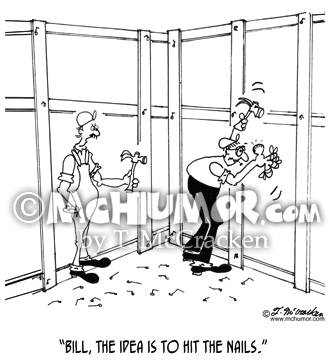 The house he is building is completely lopsided. 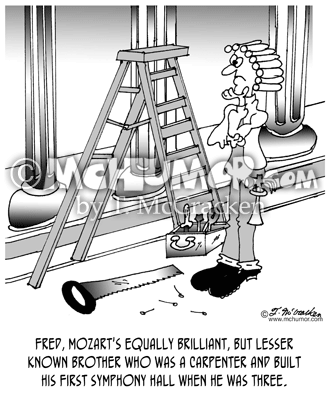 Carpenter Cartoon 7149: "Fred, Mozart's equally brilliant, but lesser known brother who was a carpenter and built his first symphony hall when he was three." 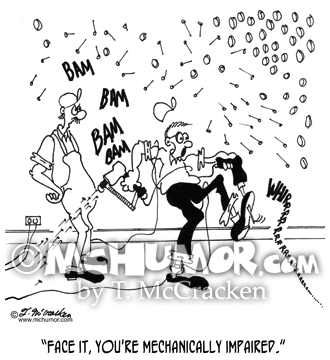 Carpenter Cartoon 6327: As a carpenter's drill and nail gun go wild another says, "Face it, you're mechanically impaired." 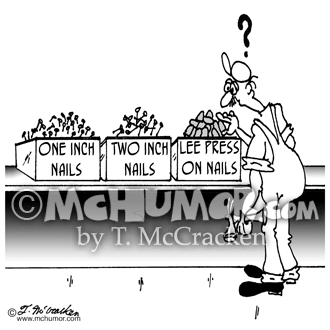 Carpentry Cartoon 6311: A perplexed carpenter looks at boxes of nails marked 1 inch, 2 inch, and Lee Press on Nails. 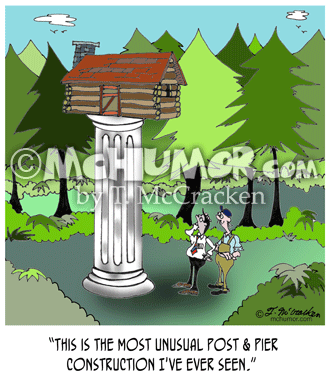 Construction Cartoon 6369: Of a tiny house on a huge column a man says, "This is the most unusual post & pier construction I've ever seen." 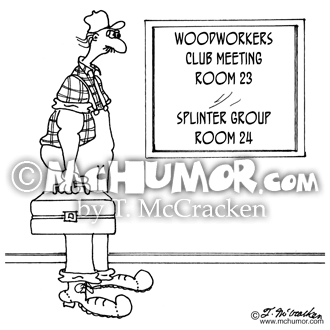 Carpenter Cartoon 5506: A carpenter looks at a sign that says, "Woodworkers Club Meeting, Room 23. 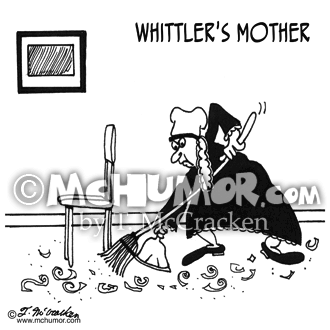 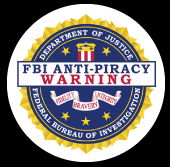 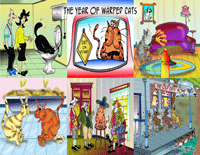 Splinter Group, Room 24."